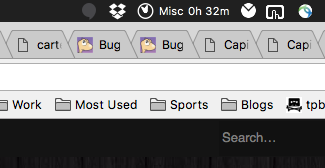 I really liked it when the menu icon highlighted yellow when a task was running, cuz when the animation doesn't run across multiple monitors -- it is an easy way to tell the timer is still running. Can you please attach a small screenshot of your menu icon. When it shows this status of not being yellow anymore - but you'd like it to be. There are so many different settings, and I would like to see how you configured it. Attached are a couple of screenshots. One of the menu bar and the other of my current preference settings. Thanks Niko! Are you running Timelime version 1.5.3? I think it has always been like this: When the menu bar icon is animated, its color doesn’t change. When animation is turned off, it turns yellow/green when the timer is running. 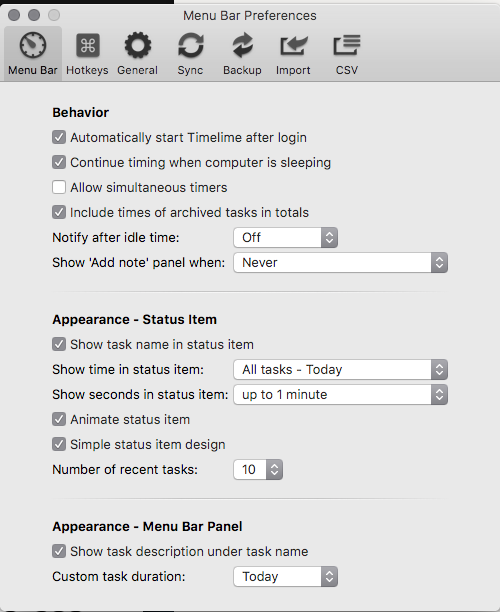 Have you tried turning the animation off in preferences? OK, I finally got it working. I had to delete/uninstall and reinstall for it to work properly. I just updated from OS X 10.11 to 10.12 Sierra, so it probably just freaked out a bit. Thank you for your help! P.S. I did have to turn off the animation for it to turn yellow. Thank you again! Love the app. Ok, great! I’m glad you got it working.